Flowers Boutique > Fresh Flower Arrangements. 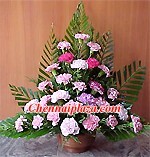 Item Description 24 Assorted pink carnations decorated with palm leaves and fillers arranged elegantly in a basket. Delivery available only at these Locations. Please order atleast 2 days in advance. 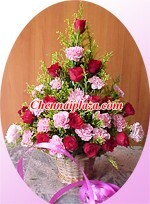 Item Description Beautiful arrangement of 24 assorted carnations with fillers in an earthen pot making a wonderful impression. Delivery available only at these Locations. Please order atleast 2 days in advance. 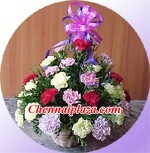 Item Description Stunning 24 assorted Carnations interspersed in a bamboo basket with fillers. Cool to wish anniversaries or weddings. Delivery available only at these Locations. Please order atleast 2 days in advance. Item Description Terrific arrangement of 25 pink carnations & 25 Red dutch roses decorated with fillers in a bamboo basket, there's no better way to wish your dear ones than with these lovely flowers. Delivery available only at these Locations. Please order atleast 2 days in advance.